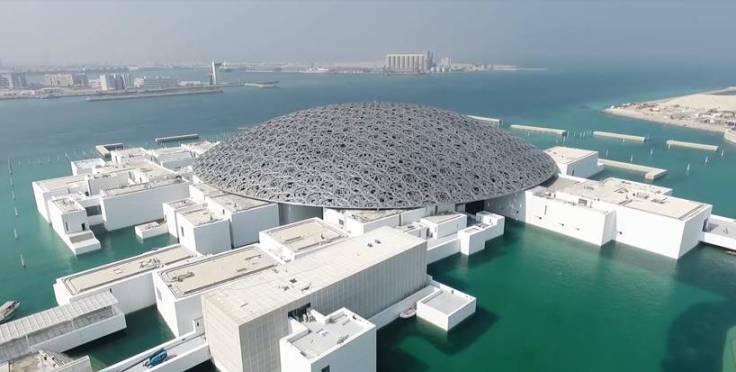 The Louvre Abu Dhabi (LAD) is an architectural jewel full of artistic treasures. This building, designed by the French architect Jean Nouvel, houses a permanent collection of more than 600 pieces and has just opened its doors. It is the first place of the cultural district that is planned to be built on the Saadiyat Island or Island of Happiness, a natural island of 27 square kilometers that will host a series of cultural establishments of great importance. In this metropolis of towering skyscrapers and shining glass and steel, it is a relief to be welcomed under a low dome that seems to float, seemingly weightless and without obvious means of support, on a group of white buildings and cuboids located on the Arabian coast, where the light is blinding and scorching heat. The LAD is the first museum in the Arab world that focuses on human stories shared through civilizations and cultures, offering the possibility of seeing humanity in a new light. Jean Nouvel, winner of the Pritzker Architecture Prize, designed this museum that represens an Arab city, under a large silver dome of 180 meters in diameter and composed of almost 8,000 unique metal stars in a complex geometric pattern, under which visitors can travel through the walks with sea views. When the sunlight filters it creates a ‘rain of light’ moving under the dome, reminiscent of overlapping palm trees in the oasis of the UAE. The Louvre Abu Dhabi was born of an intergovernmental agreement between the Arab Emirates and France in 2007, which includes the loan of the name of the Louvre for 30 years and 6 months; of artistic works of French institutions for ten years, in decreasing form as the permanent collection of the LAD grows, and the programming of temporary exhibitions for 15 years. The agreement involves 12 French public cultural institutions, led by the Louvre Museum and Pompidou Centre, informs the Louvre, explaining that the goal of the UAE with this museum is to make their country a superior cultural destination and internationally recognized for their art, education and culture. The LAD has acquired to date more than 600 works of art, many of which will be exhibited along with 300 works on loan, from 13 French institutions. These works, exhibited in chronological and thematic galleries, cover all human existence: from prehistoric objects to contemporary works, highlighting universal themes and ideas and deviating from the traditional museography, which often separates them according to their origin, indicate from the LAD. The ‘museum city’ of the Louvre Abu Dhabi covers almost 64,000 square meters, with 6,000 of these dedicated to the permanent collection and 2,000 for temporary exhibitions. Its gigantic dome covers two thirds of the museum, providing shade and reducing energy consumption, while a water channel inspired by the ancient Arab engineering system crosses it, turning the space into a refreshing oasis that invites to walk along of the aquatic course, explains the entity of the UAE. One of the emblematic works in this museum is a porcelain stoneware wall that represents hand-drawn concentric circles originated in the fingerprint of Sheikh Zayed, the founding father of the UAE, and which has been produced in collaboration with the workshops of The Sèvres National Ceramics Museum, in France. In the center, the works of Leonardo da Vinci, Vincent van Gogh, Auguste Rodin, Vincenzo Coronelli, Jacques-Louis David, Francesco Primaticcio and Alberto Giacometti stand out as well as a rare ivory salt cellar from the Empire of Benin, a 13th century reliquary chest, a Persian-style Chinese jug and a breastplate from Marmesse, the LAD points out. As for other works, there is a gallery dedicated to universal religions that presents sacred texts: a blue Koran leaf, a Gothic Bible, a Pentateuch and texts of Buddhism and Taoism. Visitors can also appreciate how the world’s horizon gradually expanded, first between Asia and the Mediterranean and then between Europe and America. The museum also presents a set of screens of the Japanese Namban, reflecting the dialogue between the Far East and Europe, and the American artist Jenny Holzer has created three engraved stone walls, which cite important historical texts of the ‘Muqaddimah’, by Ibn Khaldun. The Italian artist Giuseppe Penone has produced several works specifically for the LAD, such as ‘Leaves of Light’, a vast bronze tree with mirrors placed on its branches to reflect the ‘rain of light’. Jean Nouvel wanted his building to have a shape that matches its sanctuary function of the most valuable works of art”. In accordance with this renowned architect, this place of light and encounter reveals “a series of planetary cultures beyond the seas and centuries, and the architecture of this museum protect its treasures. It is a tribute to the Arab city, to their poetry in geometry and light, and it is an evocation of the temporalities that, inexorably, accentuate the hours, the days and the passing of our lives”.